Pairing seasonal and local ingredients with thoughtful preparation, we offer wood-fired pizza, freshly-harvested salad greens, house-craft beverages, fine teas & old-fashioned desserts. Our choice of ingredients reflect a desire for a sustainable, healthy environment inside and out– wholegrain, GMO-free, organic foods sourced as locally as possible. Truly believing we are what we eat, our food is made with the intention to nourish your family and ours. Soul Flour Bakery Owners, James Ferraris & Erica Ekrem; Photo by James Harnois. Soul Flour Bakery began in 2007 when we opened a pop up, slow-food cafe featuring a menu of organic wholegrain foods influenced by the philosophies of Weston A. Price, Tassajara, and others. We also offered baked goods at the Orcas Island Farmer's Market. In 2008, we managed an organic, seed-to-plate market garden in partnership with chef Abigael Birrell of Doe Bay Cafe. James lent his culinary skill to the cafe and was part of the team that developed Doe Bay Cafe's Pizza and Open Mic Night. 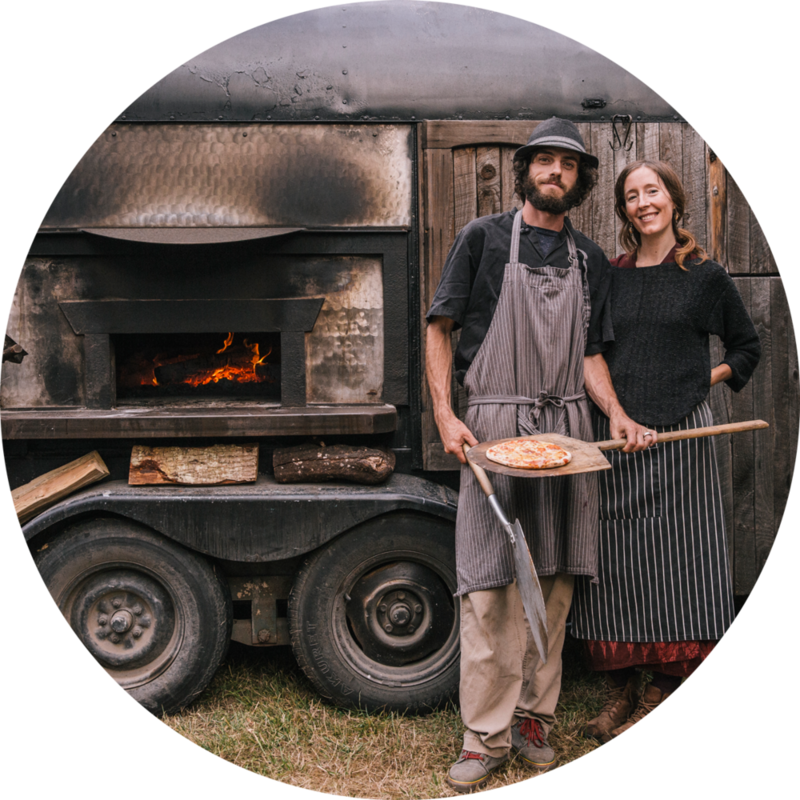 2010: After studying and drafting plans, we teamed with local blacksmith, Jorgen Harle, to forge a wood-fired oven within a modified horse trailer. Upon completion of the oven, the Roaming Hearth was clad in rough-milled cedar and outfitted for the road with generous help from friends. Turns out farm-fresh, hot-from-the-oven pizza can fuel an amazing work party. Since then, we've grown slowly and steadily. In 2014, we managed Turtlefoot, an organic produce garden and on-your-honor farm stand at the base of Turtleback Mountain. We coaxed a beautiful flock of hens from a clutch of blue-green eggs, nurtured plants from seed-to-plate, and experienced the challenges and triumphs of a grassroots business along the way. Currently, we stock our baked goods at Darvill's Bookstore and Orcas Food Co-op. The Roaming Hearth travels the island for birthday celebrations, wedding rehearsals, work parties, fundraisers, and family get-togethers. Annually, we bring pizza to festival-goers at Doe Bay Fest and Imagine Music and Arts Festival (Orcas Island), and Sh'bang Festival of Ideas (Alger, WA). New in 2019: We're now offering Tea Ceremony & Sittings to bring you unforgettable ambience and a fine steeping of tea! Owner, James Ferraris, serving a personal wood-fired pizza during a casual wedding rehearsal on Orcas Island, WA. Our signature gluten-free “pizza” option –Pizzadillas– baked in our wood-fired Roaming Hearth during an Orcas Island wedding reception.